What's a recent college graduate to do about health insurance? 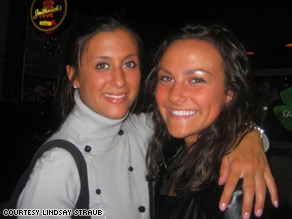 (CNN) -- Lindsay Straub says it was her "dream job." Straub graduates from college Saturday, and just a few weeks ago, she was offered an entry-level position with an entertainment company. Lindsay Straub, left, landed her dream job but had to turn it down because it didn't offer health insurance. "I was ecstatic," says Straub, 21, a communications major at Marist College in Poughkeepsie, New York. "I was ready to make the phone call to accept the position." But just minutes before she was going to dial, her mother called with some bad news. She told Straub that come fall, she'll get kicked off the insurance she currently has as a dependent through her mother's employer. This new job doesn't offer insurance, so Straub had to turn down the job. "I was devastated," Straub says. But she was also realistic: "In this economy, who can afford out-of-pocket for every doctor, every dentist visit?" Of course, the solution is to get a job that offers insurance, but that's not so easy these days. According to the National Association of Colleges and Employers, nearly 80 percent of recent college graduates who are looking for jobs haven't found one. "Lack of coverage and access to health care services puts the health of young adults at risk, and can subject them, as well as their families, to potentially dire financial consequences," says Sara Collins, co-author of The Commonwealth Fund report. But if something goes wrong -- a car accident, a cancer diagnosis -- a young, uninsured person could be in real trouble. According to the Commonwealth Fund study, half of uninsured young people said they were paying off medical bills or medical debt over time. So if you're about to graduate: Congratulations -- and welcome to the real world, where you'll need health insurance. Here are some ways to get it. While many states kick you off your parents' policy after you graduate from college, other states require your parents' insurance to stick with you, sometimes until you're 26. To find out the rules in your state, visit the Kaiser Family Foundation Web site. You can also look up the rules on the Web site for your state's insurance commissioner. On this front, Straub is out of luck. Her parents live in New York State, which doesn't require insurance companies to continue covering college graduates, according to Ron Klug, a spokesman for the New York State Insurance Department. But New York Gov. David Paterson has proposed extending coverage to unmarried children under their parents' group health insurance plans to age 29, said Klug. If your insurance company boots you from your parents' policy, you can pay to stay on under the COBRA laws. Because only you are going on COBRA, not your parents, it may not be as expensive as you think. It's worth checking it out. If you think you might land a job soon, it might be tempting to buy a short-term policy. But before you sign on the dotted line, Karen Pollitz, project director of Georgetown University's Health Policy Institute, says to read the fine print. Some short-term policies can kick you off at the beginning of each month if you've become an expensive person to insure, she says. "If you expect to start a new job in two months, but you get hit by a car in two weeks, your month-to-month policy will end mid-treatment and you'll be stuck with the remaining bills," she warns. For more on the limitations of short-term policies, see this personal story from Time Magazine Senior Writer Karen Tumulty. Pollitz recommends buying a regular policy and canceling it when you start your job. Prices vary widely by location. We asked the folks at ehealthinsurance.com to price out some policies for us. For example, a healthy 24-year-old in Dallas, Texas, can get a policy for $117 a month, or in Chicago, Illinois, for $136 per month, or Miami, Florida, for $208 a month. All these policies have a $1,000 deductible, which means the insurance doesn't start paying until you pay $1,000 out of your own pocket. Susan Vance, who teaches a class on financial responsibility to students at St. Mary's College in Notre Dame, Indiana, says you might want to consider graduate school, since policies generally will cover dependents as long as they're students. "I actually know someone who really didn't want to go to school but did so primarily for the insurance coverage," she says. Straub says she'll continue to search for a job and now knows she'll need to find one with health insurance. She says too many of her peers don't really think much about insurance. "I think most college kids take it for granted," she says. "We expect to have it. But it goes away at graduation." CNN's Jennifer Pifer Bixler, Sabriya Rice and Naaz Malek contributed to this report.